Coffee maker, Microwaves in all rooms. Casa de Tortugas was just a perfect place to host my yoga retreat. The grounds and rooms exceeded expectation and the location was perfect. My students loved being able to chill at the house or easily walk around town and beach. Mary the housekeeper and cook was lovely, too. Perfect holiday place, one of a kind. All the observations of the other reviews are true and more, this place could not be better. The really large house is perfect for large groups and children. The house is in excellent condition, everything is clean, good layout, well equipped and organized. The kitchen has a stove!, it is not shown on the pictures and originally gave us thoughts of not renting. Convenient parking for 3 cars in the alley in front of the house. Even if I would get paid for something negative to come up with, in all honesty there is really nothing. Maybe there is no toaster? Trivial. Now I feel petty. This house you can recommend to anybody without hesitation and sight unseen. The iguanas like papaya and various fruits, even fish and if you are patient you might find their hiding places and holes where they disappear in. You can place the food there and see it vanishing. The location is excellent, view and a few steps to a small beach, less then 5 minutes to the large bay and beach. During our stay the ocean was calm, water and beach perfectly clean. The pool is of a good size, well maintained with loungers, table and chairs all around. We did not go much into the village but there are a lot of restaurants and little stores. However here is some advice: Leave the boom box at home and be considered of the neighbors with noise around the pool. We unfortunately generated complains after our stay. We feel terrible about it and that put a damper on our perfect holiday. Gregg, very sorry about that! Lesson learned! Gorgeous property with amazing views and beautiful landscaping. We began talking about a New Year Eve trip for our family and our friends and their children a year ago. We wanted a simple place to just spend time together and really do nothing. 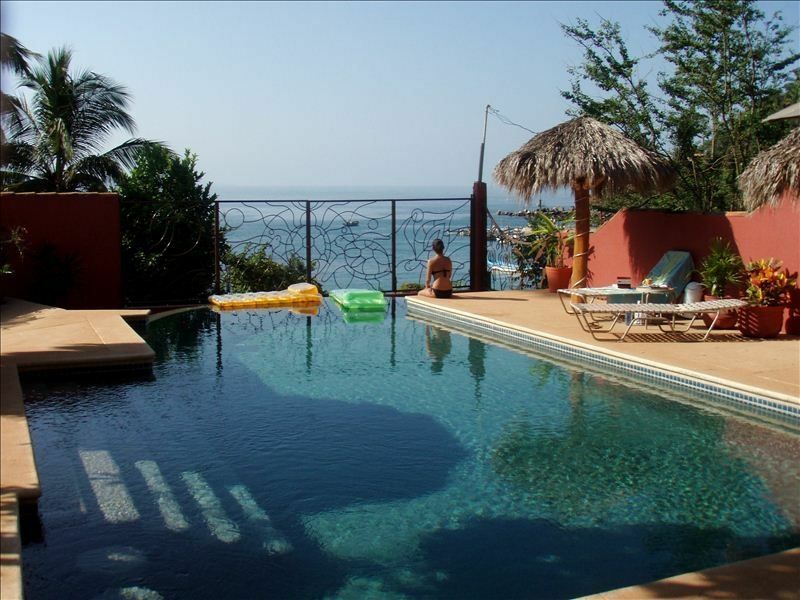 With our group of 4 adults and 7 children (ages 2- 10), we found the perfect place in Casa de Tortugas in Chacala. The house is a great set up for two or even three families. The views are amazing, the beach is a few steps away, and the pool is perfect for the kids to spend endless hours. We so loved the little town with restaurants right on the beach. Bonus was swimming with huge pelicans diving all around you. Truly a magical experience. Our only excursion was whale watching with Hector and we saw at least 15 very active whales! This town and home are everything if you are looking for a laid back, true Mexican getaway, and relaxation. We had one minor glitch with a tree branch taking out our power line, but the owner and electrical company were quick to respond and everything was up in running by time we returned home from dinner. Also, Yadi provided the most wonderful home cooked meals and it added so much authentic flavor to our trip. Highly recommend having her cook for you! We will return in the near future! Had a great time, everything was just perfect. The property was just the way showed in pictures. Everything was nice and clean, pleasant. Our group of ten adults fit perfectly here. We had a wonderful time playing in and lounging by the pool. Dinners by Mari were delicious! We loved not having to go out at night or do our own cooking. I highly recommend this place!! !